Our customers in Milton Keynes decided that they wanted their Superior Shed to stand out in their large garden. 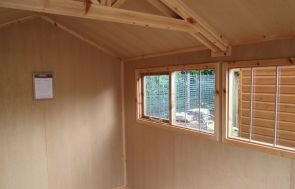 They opted for the colour Black from our Sikkens paint system which provides long lasting protection, but still allows the graining of the wood to show through, enhancing the natural beauty of the shed. We have lots of paints to choose from for your garden building from various paint systems - including Farrow & Ball and Valtti - to create the ideal finish for your shed. Our customer designed their shed with double doors so they were able to manoeuvre their ride on lawn mower in and out with ease. The windows are made in-house by our joiners to provide for the high quality products that we require. It is important to us that the customer is happy with the product that we provide for them. This shed was designed with heavy duty felt roofing, the mineralised felt is non-rip and is heated on to the roof of the shed to give longevity. They provide protection from natural weathering and protect the wood from erosion. Our security pack was added to the shed, which features integrated window bars, security screws on the hinges and a 7-lever anti-lock, anti-pick lock for maximum security. These security packs are extremely strong and robust. Each of our garden buildings are built at our Norfolk factory HQ near Swaffham using slow-growing FSC® certified timber sourced from our partner sawmill in Northern Sweden. 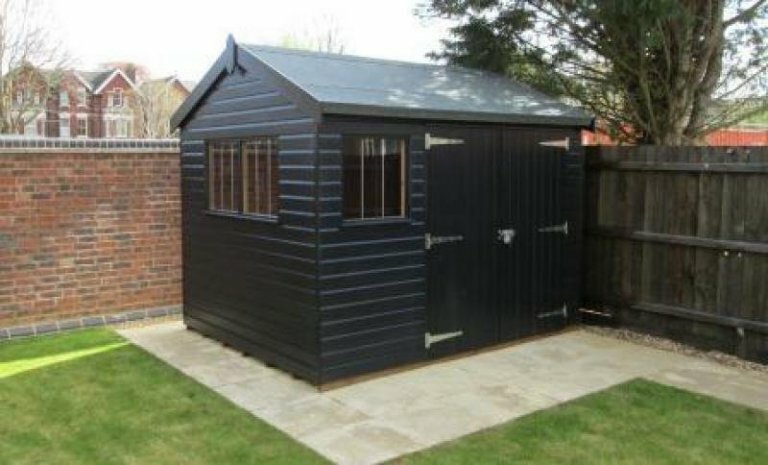 There are so many different styles and variations of sheds - click on the link below to discover more.